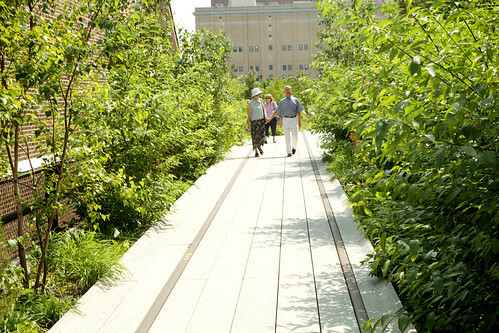 When I got the news yesterday that the second section of The Highline was open, I pretty much darted from my desk. Clearly, an extra long lunch was in order. 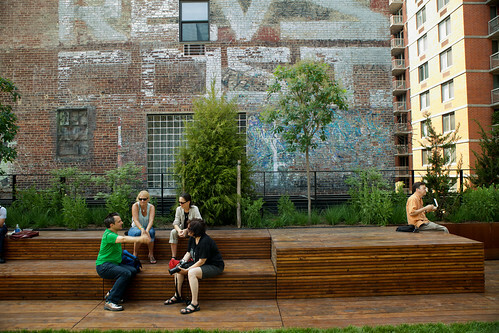 The design is more of the same brilliance that makes the southern part such a wonderful place to visit and has some added features including a lawn, a bleacher like seating area, and, below the north end, a food truck fueled snack bar – with beer. So, yeh, it’s pretty great. Get a first look at the space after the jump. 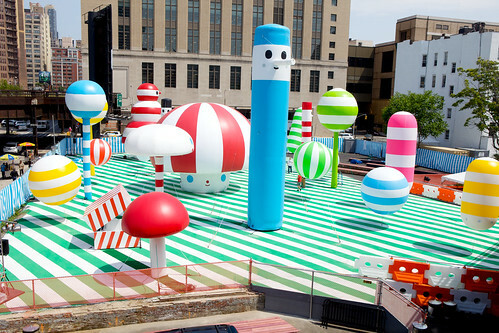 I don’t really know what this rainbow park is exactly, but I believe it’s going to be attached to the food truck space. That all opens today, so I’ll stop by soon to get a better look. 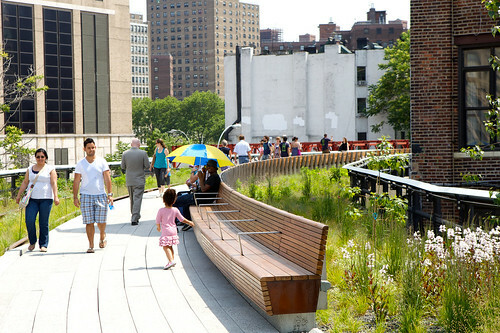 There’s another street overhang on 25th Street (I think) that let’s you look down on the traffic below. I was, of course, not the only one with a camera out. 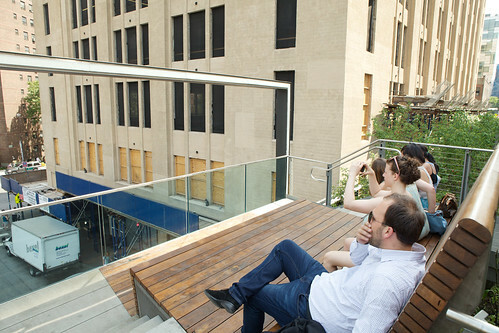 One of the things I love about The Highline is that there are so many other people taking pictures at any given time, I never particularly stand out when I’m photographing up there. 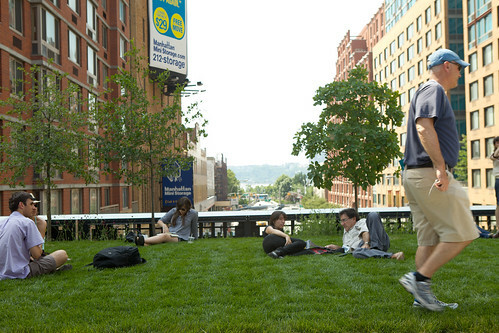 A lawn elevated a couple stories up is a little surreal, especially when trucks are passing underneath, but it looks like a fantastic place for a picnic. Right next to the lawn you’ve got this bleacher seating (stationed under this great old REVS COST piece) that also looks totally comfortable and a great place to spend an afternoon. 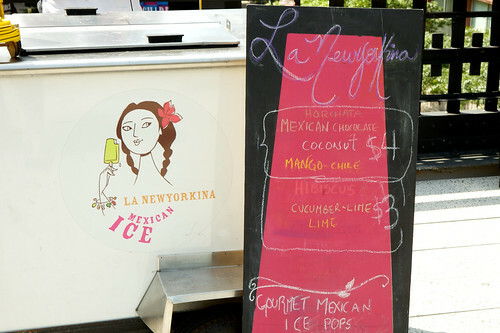 The one vendor in the new section (so far) is La NewYorkina, a cart selling Mexican ice cream pops.I didn’t get to give them a try yet, but with the heat we’re expecting this week, I’m sure they’ll do a brisk business. The space widens and narrows and in areas makes you feel like you’re a hundred miles away from the city below. I could keep gushing, but you really just have to see for yourself. Check out the rest of the photos on Flickr.